Andrea Lipomi runs Feetish Spa Parlor housed here in Emergency Arts. She has been a successful entrepreneur for many years. We asked her to tell us a bit about herself and how she does what she does so well. Q: Tell us a little bit about yourself. What brought you to the spa business and why Las Vegas? 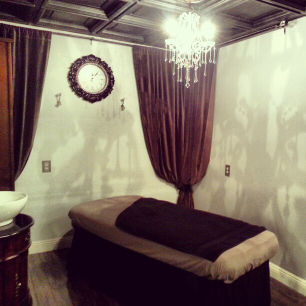 A: I received my first professional massage over fifteen years ago and it changed my life! I wanted to be able to share that feeling with others, so I went to massage school back in Rochester, NY in 2005 (then esthetics school, then nail school). Vegas called to me because the weather is great and the spas are fantastic...so here I am! Q: Not only do you offer an impressive range of relaxing treatments and services, but you also sell several lines of products. What are your favorite services and what do you love about the products you sell/use/represent? A: One of my favorite services to perform is the Signature Feetment. It combines a foot soak, scrub and massage with a cooling foot balm application. Then I send the remainder of each tube home with each client. That's what I love about the body and skin care products that I carry at Feetish: They work! And they take the guesswork out of self care! I have a lot of products in stock right now that are priced in the $5 - $25 range, because people shouldn't have to break the bank to take care of themselves. Q: What sets you apart- makes you/your business unique? A: I believe Feetish Spa Parlor is unique not only in its atmosphere, but also in that I try to be aware of every single client's individual needs. If you walk away feeling like you were the most important person in my world for the last hour or two, I've done my job. To book online, see the spa menu, purchase gift certificates click HERE or call (702) 587-0745 to schedule spa services. Click here to receive exciting news from Feetish Spa Parlor. Small Space Fest and a Call for Artists! The Weft in the Weave, a creative collective dedicated to generating, producing and curating works of art, both performance and visual, has partnered with Emergency Arts to gather artists from diverse backgrounds for one explosive night of expansive and exciting works. The art festival has been named Small Space Fest . Using the event as a conduit, The Weft in the Weave Collective seeks to spark generative conversations and ongoing exchanges between local and visiting artists. They have put out the call for artists and are eager to present these works at the Small Space Fest on June 20th, 2016! The art and performances will be installed within the building's unusual architectural spaces such as broom closets, cabinets, corridors, stairwells, and common space. For more information about the event click here. Author, poet, spoken work performer and artist, Chris Cipollini has a new book out, The Secret Kingdom, now available on Amazon. Reading and book signing at The Writers Block on March 26th. Awesome write up about Brent Holmes' exhibit! We welcome Heather Byington to the Emergency Arts Collective at 520 Fremont Street in Downtown Las Vegas! Heather is new to the Las Vegas art scene. Her photography is stunning, beautiful, haunting, dark, surreal. We can't wait to see more of her work! The Contemporary Arts Center opened its new gallery space last night with an exhibition entitled, "Taste." KNPR interviewed the CAC's president, Melissa Petersen, hours before the opening. In case you missed it, the link for the interview is below. We're so excited for this new website that highlights contemporary Las Vegas art! Yay! Thanks for your hard work, Wendy!